To unwind from the 1990 Guild School workshop in Castine, ME, we took the slow, winding route down the Maine coast. Just north of Freeport, where Route 1 prepares to enter the Maine Turnpike, we came upon the Maine Idyll Motor Court, a cluster of old-timey, generic little-white-cabins-with-green-shutters, porches and screen doors seeming to grow from the duff under the pines. For a moment it felt as if we were lost in some 1930s movie dream sequence–The Miracle on Route 1. Something in the simplicity of the cabins, something amiable, tugged at us. For several years we had explored character buildings for our workshops–Pine Lake Park roadside stand, The Airplane Café, the fish-shaped Fish & Fries stand. For those, old photos in books were our sources. Besides giving us a chance to play in quirky, these structures left lots of room for invention, filling in the spaces the photos left out. But here along the roadside, the enigmatic charm of the real thing once again tugged at us. The Maine Idyll– “Cottages Among the Trees” according to the owners’ business cards—seemed like the perfect vehicle for our next Maine workshop. We turned into the driveway and drove under the trees to an open cabin. There an agreeable cleaning woman allowed us in to see the tiny rooms, and to measure and draw details. Each cabin had a fireplace, old fashioned roller window shades, and a bathroom. Top to bottom, the interior was finished in unpainted knotty pine boards. From the ceiling hung a single simple light. The room was just big enough to hold a double bed and small bureau, and maybe a table and chair, and still have a path to the bathroom and front door. The baths were barely wide enough for toilet, sink and shower stall, but the cabins were clean, welcoming, and quintessentially Maine-like. Unlike modern chain motels, these looked as if people actually relaxed in them. Noel sketched and photographed while I wrote down details and personal observations. 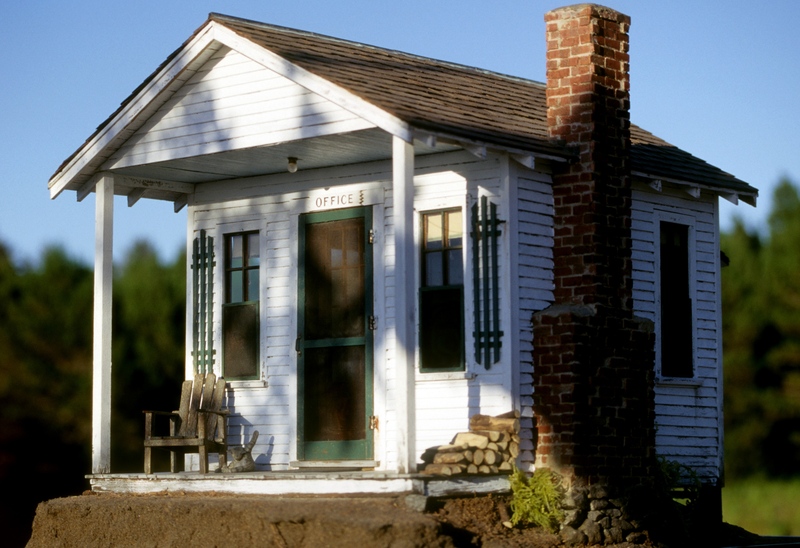 The hominess, humanity and history of the buildings spoke to us. Then came the cosmic leap between inspiration and getting the job done. Once home again, Noel drew his interpretation of what our miniaturized version of Maine Idyll would look like. What it would look like included multi-level terrain to show the understructure and mess of plumbing pipes at the back of the building. That meant the base had to be built in levels, three, to be exact. I nixed the idea as way too complicated from the aspect of building, and teaching, multiple structures efficiently, but Noel was deaf to my reasoning—it was going to “make” the scene, and it was scenes as much as structures we were fabricating. 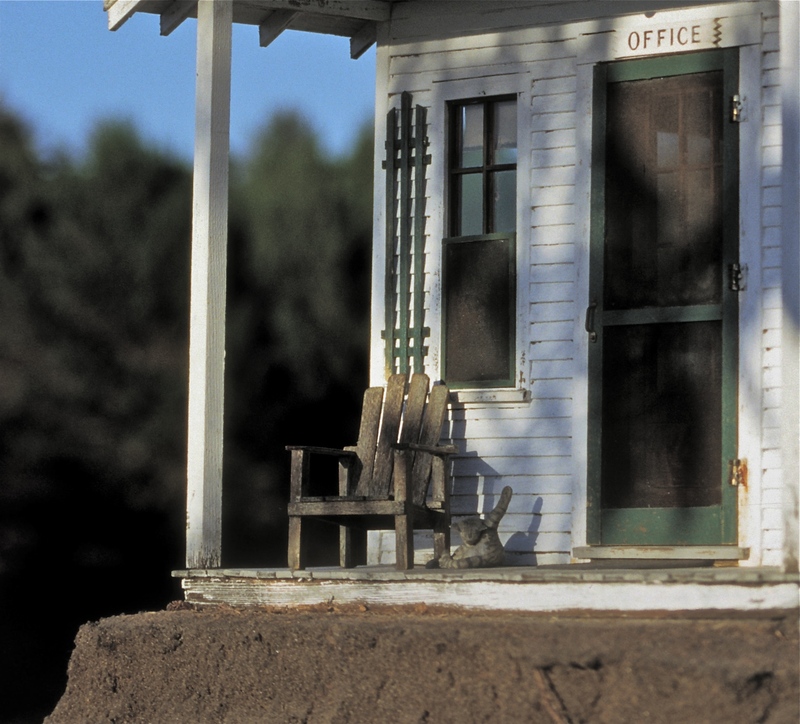 The above photo gives you a closer look at the porch deck boards, the terrain we made by sprinkling sifted sandy dirt over Elmer’s glue, the rust on the door hinges–touched in with raw sienna tube acrylic paint–and the aging at the bottom of the porch post. The narrow lap siding looked great on the project, but was laborious, eating up class time that we needed to work on other things–we retired the project after three classes, to save the students, and ourselves, the aggravation of things not getting done. As for cosmic leaps, 1991 provided some eye-poppers for the world, including the opening of the Internet, and the invention of the web-browser. It also brought The Silence of the Lambs (which we did not leave the studio for), and Hook (which we did). That April, while the Space Shuttle Atlantis blasted into the Florida skies, Noel began the job of building the prototype plywood shell and tiered base onto which we would begin the building-up of the details. Because neither of us is truly a builder, or carpenter, the construction phase was always more a chore than a pleasure. Wood and nails just happened to be the means to the end—the fun was in the design, then the bringing it to life with finishing details. Once we had the structure, we made daily decisions about what to include for class (we only taught exterior treatments)—juggling size and positioning of the door and windows, depth of the deck and roof overhang, what kind and how many shutters. For siding, instead of our usual shingles, we opted for the narrow, horizontal drop siding of the original cabins—the linear quality of the siding was what made the cabins so archetypal. Then on to the chimney size and shape. Each of the elements needed to echo that remembered sense of cohesiveness and habitat. The fine tuning of the project, like the frosting on the cake, is our favorite part of the work. After everything is cut, built, and painted, after the roof goes on and the landscape is dry, then we get into the details that bring the piece alive. The small human and natural details of dirt, moss, weather and habitation that will involve the viewers by reminding them of something they once, saw, knew, smelled or read—this is where we get back to inspiration. 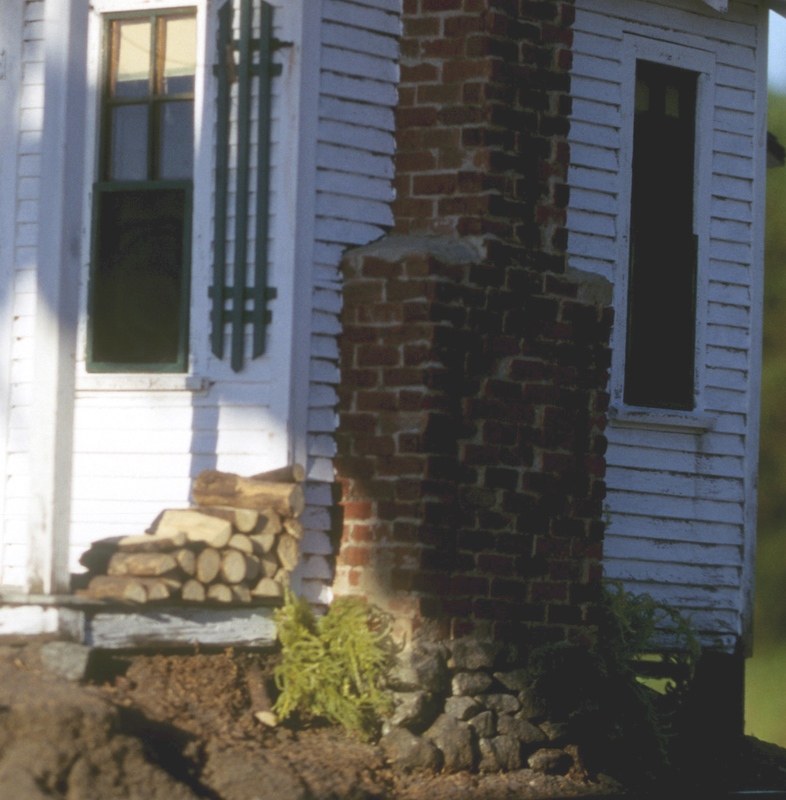 To stoke Maine Idyll’s brick fireplace, Noel made a woodpile for the porch. He cut and split windfall twigs from our holly trees out front. Their rough bark and grain looked more like oak than Maine’s famed pines, but we hoped no one would quibble over our choice. Plus, there are oaks in Maine. For your own woodpile, it’s best to gather twigs in advance, and allow them to dry indoors for several months before cutting them into miniature logs—dry wood holds a tighter grain. For kindling Noel sliced and split cedar scraps from under the work table. After the porch was “done”, Noel decided it still lacked something. Since this was a coastal summer cabin, there must be someplace nearby to swim, resulting in wet bathing suits and towels. He made a clothesline from narrow wire, which he strung over the woodpile from porch post to the front right cabin corner, attached at either end with small brass screw eyes aged with Brass Black and painted white to match the siding. To draw the eye to the wire, he added one tiny clothespin, carved from an ornate toothpick given to him years before by Hawaiian miniaturist Carl Nakahara. To see how subtle the effect was, look hard in the upper left of the photo above to see the line. 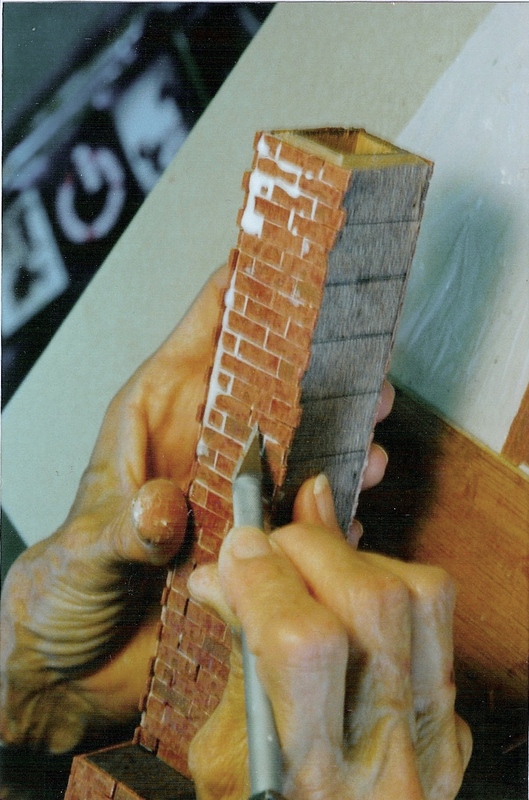 This photo shows a student constructing the chimney. She has glued on the bricks, and is going back with an Exacto knife to clean out the grout lines, and straighten as needed. The un-bricked side is where it will glue to the project wall. We make the plywood chimney base, which the student then marks with horizontal pencil lines to keep her brick rows straight. The bricks were cut from the old kitchen brick-pattern tiles from which we had removed the self-stick backing with gasoline, then sanded and scored with the brick shapes. Elmer’s white glue was then applied to the base, the bricks broken off one-by-one, and glued on. The chimney was then grouted, cleaned up again, and glued to the project. At the end it was aged with acrylics to simulate rust stains from flashing, soot and creosote from the fires, and general drippy grunge from weather and the pines. Among the final touches were the plumbing pipes, the whole reason for the labor-intensive tri-tiered base, exposing the nuts and bolts of the cabin understructure. Inexplicably, we have no good photos of this. The next best thing (or maybe better) is for you to find some old house or building and crawl around in the crawl space, or investigate your own basement ceiling to see what a maze of plumbing pipes can look like. In miniature we chose a few crucial pipes (under the bathroom), joints and elbows, enough to catch the eye and jog the memory without taking over. You can have fun making pipes from painted and aged dowels, cutting elbows in pie-shaped slices from the ends, reassembling and gluing them together for the desired turn, and wrapping the joints in narrow strips of masking tape. Then paint and age the whole thing, adding some dirt or rust dust for effect. It’s an illusion, a funky one, but one of those details that makes the rest fall into place. And yes, Noel was right about the tiered base. Our mini-Maine dream sequence came to an end when it was time to pack up for the real Maine. It’s good we had deadlines, as we might have gone too far–there’s always the next project for dreaming up something new. In my next posting, I’ll discuss the interior, including the bathroom plumbing. This entry was posted in Miniatures, Teaching and tagged architecture, dollhouses, miniature bricks, miniatures. Bookmark the permalink. We’ve stayed in one of those cabins – and it was wonderful! you can only barely notice. Wonderful! I was born in Boston but raised in Maine and the little cabin reminds me of my teenage years there. So wonderfully 70’s !